There’s nothing better than the love and joy that a dog brings into your home. But there are some things that can come along with your pup that you would rather not be exposed to, like fleas! They may be small, but fleas can wreck havoc on your home. They can cause serious pain and suffering for your four-legged friend, and if left untreated, they can completely infest your house and turn you and your family into their lunch, too! Fortunately, there’s a simple way to avoid fleas. How? – By outfitting your pooch with a flea collar. But choosing the best flea collar for dogs can be a pretty daunting experience because there are just so many options to choose from. To make the process a bit easier, here’s a look at what we consider to be the five best flea collars for dogs currently on the market. Why You Need a Flea Collar? How Do Flea and Tick Collars for Dogs Work? Now that you’ve seen our top picks for flea collars for dogs, let’s take a more detailed look at each one. Below, you’ll find out more information about these top rates flea collars for dogs, including their features and what we like about each one. When you’ve decided which flea collar you’d like to purchase, just click on the button to find the best prices on Chewy and Amazon. 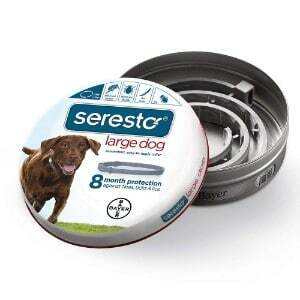 Our first choice for the best flea collar for dogs is the Bayer Seresto Flea and Tick Collar for Dogs. This collar is recommended by vets as a highly effective product for flea and tick prevention. With just one collar, your pup will be protected from those pesky pests for 8 months! Unlike topical flea and tick prevention products, there’s no odor, mess, or oily residue left behind; things that both you and your pup will love. And, unlike oral preventive products, which only work if the fleas and ticks bit your dog, this flea collar will kill those pests immediately on-contact; your dog won’t have to suffer at all! The Bayer Seresto Flea and Tick Collar for Dogs is waterproof, which makes it an ideal choice for pups that love to swim, like Labrador Retrievers and Golden Retrievers. It will even continue working after you give your dog a good scrubbing with a standard dog shampoo or even a medicated shampoo for dogs; now that’s powerful protection. But, there’s no need to worry that your furry friend will be harmed, because while this flea and tick collar offers strong protection, it uses a low concentration of non-toxic ingredients. And, in addition to keeping fleas and ticks at bay, it can also kill lice and the parasitic mites that can cause mange. The Bayer Seresto Flea and Tick Collar for dogs is available in two sizes; one option is for dogs under 18 pounds and the other is for dogs that weigh more than 18 pounds. Conclusion: For long lasting, prescription-grade flea and tick prevention without the prescription, the Bayer Seresto Flea and Tick Collar for Dogs is an excellent choice. Whether you have a small breed, such as a Yorkshire Terrier or a Chihuahua, a medium-sized breed, such as a Border Collie or a Cocker Spaniel, or you have a large breed dog, like a Rhodesian Ridgeback or a Newfoundland, if you’re looking for powerful flea and tick prevention for your pup, the Maxtry Flea and Tick Control Adjustable Waterproof Collar Protect for Dogs might be the right choice for you. This flea and tick collar for dogs is 25 inches and can be easily adjusted so you can achieve the proper fit for your pup. If it’s too long, just adjust the collar so that it fits comfortably around your pup’s neck and cut off any excess material. It also comes with two separate collars, so if you have two dogs, you’ll be able to provide them with pest protection with just one purchase. 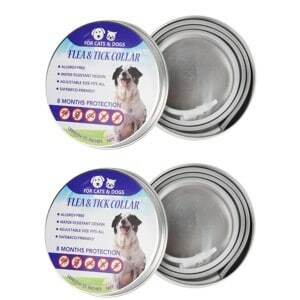 This flea collar for dogs not only repels fleas, but it also repels ticks and other pests, such as lice and mosquitoes. It uses high-quality, non-toxic ingredients, including Eucalyptus and Citronella Oil, so there’s no need to worry about harming your dog or the environment. This collar offers 8 months of powerful protection, and it’s completely waterproof. So, whether you’re is swimming, taking a bath, walking in the rain (in his posh dog raincoat, of course), or his pouncing through puddles, he will still be protected from those pesky pests. Conclusion: For safe, natural, affordable, and long-lasting flea and tick prevention for your pet, the Maxtry Flea and Tick Control Adjustable Waterproof Collar Protect for Dogs could be the solution you are looking for. 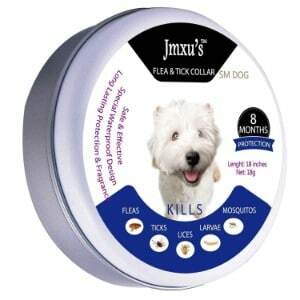 Next up on our list of the best flea and tick collars for dogs is Jmxu’s Flea and Tick Collar for Dogs. Like the other flea and tick collars on our list, this one also offers 8 months of protection, so you can have peace of mind knowing that your dog will have constant coverage for a long period of time. Like the Maxtry flea and tick collar, this one is also designed to fit dogs of all sizes. The collar is 25 inches long so you can find the right fit for your pup; just snip off any excess material. If you’re wondering if this flea and tick collar is safe for your four-legged family member, the answer is YES! The ingredients are all natural and won’t cause any irritations or allergies, and it’s environmentally friendly, too. And, in addition to repelling fleas and ticks, Jmxu’s Flea and Tick Collar for Dogs also repels other pests, like lice, mosquitoes, and even the larvae of these pests. This flea and tick collar for dogs is backed by a lifetime guarantee. If, for any reason, you are not satisfied with this product, you can request a full refund or a replacement collar within 90 days of receiving it. There’s no mention of it being waterproof, so to err on the side of caution, it’s best to take the collar off before exposing your pup to water. Conclusion: Jmxu’s Flea and Tick Collar for dogs is a safe, affordable, effective, and easy to use flea collar; however, it’s not waterproof, so make sure that you remove it before exposing your dog to water. 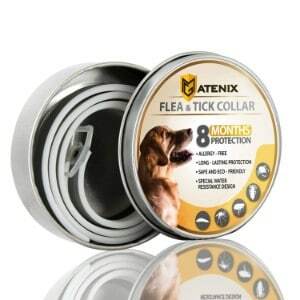 The MATENIX Dogs Flea and Tick Prevention collar is another great flea and tick control collar. This collar offers a one-size-fits-all design; just adjust it so that it fits your pup’s neck properly and snip off any excess material (do keep in mind that the collar shouldn’t fit too tight; just like with his dog collar, you should be able to fit two fingers between your pup’s neck and this flea collar.) Like some of the other flea and tick collars mentioned on our list, this one is also environmentally and pet-friendly. Instead of using harsh chemical ingredients, this collar uses essential oils that naturally repel pests, so there’s no need to worry about any adverse reactions while your furry companion is wearing this collar, such as an allergic reaction or irritation. And, when you’re ready to toss the original collar out and replace it with a new one, it won’t harm the environment. The MATENIX Flea and Tick Collar for Dogs offers long-lasting flea and tick prevention; your pooch will be covered for up to 8 months. And, not only will this color protect him from fleas and ticks, but it will also keep lice and other nuisance and dangerous pests at bay, like mosquitoes and lice. And, since it’s waterproof, your pup will be covered even when he’s playing with interactive dog toys in the water, taking a bath, or splashing around in puddles while you’re walking him on his dog harness. Conclusion: Overall, the MATENIX Dogs Flea and Tick Prevention Collar is a high-quality flea and tick prevention collar. It’s waterproof, adjustable, and non-toxic. While some users have complained about the smell, we chalk that up to the fact that scents are a personal preference, because in our opinion, the odor was not overpowering and was actually quite pleasant. 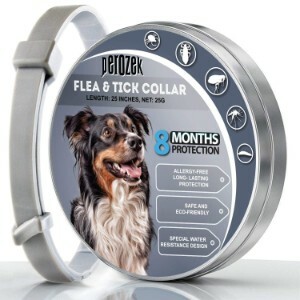 And the last, but certainly not the least, pick for the best flea and tick collar for dogs comes from PEROZEK. If you’re concerned about the safety of your pet and the environment, then you are going to love this collar. Instead of using harsh ingredients, PEROZEK Flea and Tick Prevention Collar for Dogs uses essential oil extracts to keep pests at bay. The essential oils absorb deeply into your pets skin without causing any harm and successfully disrupt the life cycle of fleas and ticks. It offers long-lasting coverage for up to 8 months, so you can have peace of mind knowing that your dog will be protected for most of the year. The adjustable size of this flea and tick collar for dogs makes it an excellent choice for all breeds. It’s 25 inches long and features a clasp that is easy to close. Just place it around your pet’s neck, adjust is to the right size, and clip off any excess material. And, since it’s water resistant, you don’t have to worry about taking it off for baths, before your pet swims, or when he goes out on rainy days (however, the collar should not be worn in the water too much, as excessive exposure to moisture could damage the essential oils and thus reduce the effectiveness of the collar). Conclusion: Overall, the PEROZEK Flea and Tick Prevention Collar for Dogs is a great choice. It offers long-lasting, safe, and affordable flea and tick prevention for your pup. As a pet parent, you want the absolute best for your dog. You go to great lengths to ensure that he has the very best of everything, like his dog crate, dog bed, dog bowl, and dog food. You make sure that he’s as comfortable as possible by outfitting him with cooling vests for dogs on hot days, and take measures to prevent losing him with a GPS tracker for dogs. Since you care so much about your furry family member, it makes sense that you want to prevent him from picking up pests, like fleas and ticks. To ensure that he’s well protected against these pests, a flea collar is the easiest solution. But, not all flea collars are made the same. Some are made of harmful ingredients or just don’t really offer any results. To guarantee that he’s protected, it’s important that you pick the best flea collar for dogs. If you’ve never purchased a flea collar before, you probably have a lot of questions. In this portion of our review, we offer a detailed buyer’s guide that will answer your questions to help you choose the best flea and tick collars for dogs that you can find. Even if you are meticulous about grooming your pup, there’s still a chance that he can pick up fleas and ticks. You see, these pets look at your pup as an attractive host. Their fur conceals them and keeps them warm, and of course, their warm blood is a tasty treat. In other words, fleas and ticks can easily sustain on a dog, and what’s worse, they can reproduce on them, too! All it takes is one flea and your pup can quickly be infested! All dogs are susceptible to fleas and ticks, but those who spend a lot of time outside, in a dog house, an outdoor dog kennel, or a dog playpen, for example, are even more susceptible. Why? – Because of the simple fact that they are outside and are more likely to encounter these pests. The best way to prevent an infestation of fleas and ticks is by being proactive and outfitting your pooch with top rates flea and tick collars for dogs. A flea collar for dogs might look pretty simple, but the science behind how they work is actually quite complex than you probably imagine. There are three basic types of flea collars, and each one works differently. The first kind of collar is made to repel pests. They contain ingredients that fleas, ticks, and other pests find unpleasant, making the dog an inhospitable host. The other type of flea and tick collar for dogs is designed to treat pests. These collars release ingredients onto the dog, and when combined with the oils that his skin naturally produced, those ingredients are spread throughout his skin. When a flea or tick bites the dog, it dies. In other words, your dog has to be bitten in order for these types of collars to work. And lastly, the third type of flea and tick collar for dogs contain active ingredients that will kill pests as soon as they make contact with your pup; the pests don’t have to bite your dog to be killed, but rather they will be killed as soon as they land on him. Like other grooming and health supplies that are on the market, such as nail clippers for dogs, toothpaste for dogs, toothbrushes for dogs, and flea treatment for dogs, there are countless flea collars to choose from. While having a lot of options to choose from can be a good thing, it can also make it difficult to decide which flea collar is the best. With that said, you’ll be able to narrow down your choices by assessing all of the options and looking for some key characteristics. Below, we share some key features that separate the best flea and tick collars for dogs from the sub-par options. Non-toxic. Some of the ingredients used in flea and tick collars for dogs may be toxic, as they are supposed to repel or kill the pests; however, those ingredients should not be toxic to your dog or to humans. If you want to completely avoid harsh chemicals, opt for a collar that is free of harsh chemicals and instead uses natural ingredients, like essential oils, to keep fleas and ticks at bay. Water resistant. The best flea collars for dogs are water resistant. Even if your pup doesn’t like the water, it’s still a wise idea to use water resistant flea collar. That way, if your dog does come in contact with water – when you’re giving him a bath, for example – you don’t have to remove the collar or worry that the collar will lose its effectiveness. Long-lasting protection. While a collar that lasts for only a month might be effective, having to constantly change it can become bothersome; not to mention, it can become expensive. Therefore, it’s best to use a collar that offers long-lasting protection. The best flea collars for dogs will be effective for at least 8 months. While you love being a pet parent, not every aspect of owning a dog is enjoyable; fleas, ticks, and other types of pests are one of the biggest complaints among dog owners. These pests are more than just a nuisance; they can be downright dangerous. Fleas and ticks can carry tons of diseases, which can cause a host of health issues for your pet, and for you, too. By using the best flea and tick collars for dogs, you can keep these pests off your dog and out of your home so that you and your pooch can enjoy your time together without having to worry about pesky critters. I bought this collar for my neighbors dog in Feb and the dog rarely goes outside and is infested with fleas 3 months later. There is no aroma coming from the collar at all. I want a refund!! Which collar did you buy? Sorry you’re having a problem with it. I suggest contacting the manufacturer to see if they can give you another one.